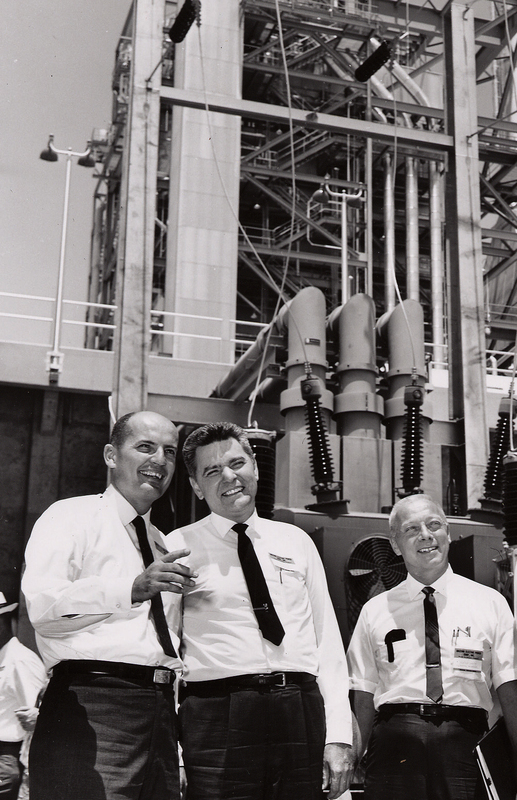 Attending the May 1965 dedication of AEPCO’s 85 MW combined cycle units (L to R) were Clayton E. Niles, representing Gov. Sam Goddard’s office; Norman M. Clapp, REA administrator; and AEPCO General Manager Dexter M. Smith. The board elects J.A. Kartchner of SSVEC as president, and opens an office in Tucson. 1962—The board appoints Dexter M. Smith as AEPCO’s first CEO. The co-op moves its headquarters to Benson, Ariz., and purchases small diesel generating plants from Member co-ops. The Salt River Project becomes a Member, and the relationship continues off and on over the years. 1963—AEPCO energizes a new 10 MW gas turbine south of Cochise, Ariz., and serves 14,419 consumers through its Member co-ops. 1964—The G&T energizes a new 75 MW steam unit and a 10 MW gas unit at what’s now known as Apache Generating Station in Cochise. 1965—Norman M. Clapp, administrator of the federal Rural Electrification Administration, speaks at dedication of the new units at Apache Generating Station. The G&T builds two substations and 147 miles of transmission line, and breaks new ground for a headquarters in Benson. 1971—Mohave Electric Cooperative of Kingman, Ariz., becomes AEPCO’s fifth Member distribution co-op. 1972—AEPCO completes construction of two new gas units at Apache Generating Station, which produce a total of 85 MW of power. 1974—The G&T purchases 70% of the Roadside Mine near Grand Junction, Colo.
1977—Jerome B. Flanders becomes the cooperative’s second CEO. AEPCO begins working with Carbon Coal to develop Mentmore Mine near Gallup, N.M., and sells its interest in Roadside Mine. The G&T invests in a transmission line between Tucson and Phoenix to facilitate power sales to other utilities. 1978—AEPCO dedicates two new 175 MW coal-fired units at Apache Generating Station and completes major additions and upgrades to substations and transmission systems. 1979—Anza Electric Cooperative of Anza, Calif., joins as the sixth distribution co-op Member—all six are Class A Members. AEPCO opens Mentmore Mine and begins operating its own unit train to ship coal to Apache Generating Station. 1980—AEPCO introduces new rates to reduce demand at peak times and offers special rates to irrigators. 1983—Leaders help form Consumers United for Rail equity to fight unfair tariffs paid by captive shippers, and AEPCO continues to take a leadership role in coming years. 1988—Donald W. Kimball is named AEPCO’s third CEO. 1991—AEPCO converts its two coal units at Apache Generating Station to dual fuel, allowing the burning of either coal or natural gas. The Mentmore Mine ceases operation after 12 years, along with AEPCO’s train. Working with the U.S. Fish and Wildlife Service, the cooperative develops a wildlife viewing area near Apache Generating Station. AEPCO dedicates its expanded and remodeled Benson headquarters. 1998—AEPCO creates Southwest Transmission Cooperative (SWTC) and Sierra Southwest Cooperative Services (Sierra), both operating under AEPCO’s umbrella. AEPCO joins Touchstone Energy, a national marketing organization for select rural electric co-ops across the nation. 2001—SWTC and Sierra begin operating independently. Until now, Member co-ops have purchased all their power from AEPCO. This year, Mohave Electric becomes a partial-requirements Member. AEPCO builds two gas-fired peaking units at Apache Generating Station with a total capacity of 38 MW, and adds a coal-blending facility. The new SunWatts program offers customers incentives to use solar. 2002—AEPCO completes reclamation of Mentmore Mine 13 years after it closes, and receives state and national recognition for project quality. 2006—AEPCO leads the formation of Southwest Public Power Resources Group, where utilities work together to meet power needs. The Arizona Corporation Commission approves a Renewable Energy Surcharge and Tariff for AEPCO as part of a new program requiring utilities to increase use of renewable fuel. 2007—Valley Electric Association of Pahrump, Nev., becomes AEPCO’s first Class D Member and begins purchasing power on a short-term basis. 2008—Electric Light and Power Magazine reports that Apache Generating Station operates at a 96.3% capacity factor—fourth on a list of the top 20 plants in the U.S. SSVEC becomes a partial-requirements Member. 2010—Trico becomes a partial-requirements Member. 2011—Patrick Ledger is appointed AEPCO’s fourth CEO as the co-op celebrates its 50th anniversary. After a three-year court battle, AEPCO wins a significant rate case from railroads delivering coal to Apache Generating Station. Refunds and lower future rail rates allowed by the decision will reduce AEPCO’s costs and result in savings to Members. AEPCO and SWTC transition to using ACES to market surplus power to non-members, resulting in cost savings and enhanced services. 2012—Apache Generating Station’s steam units burn natural gas for the first time when natural gas becomes less expensive than coal. The 2011 rail settlement and resulting lower shipping costs allow AEPCO to purchase coal from lower-cost sources in Wyoming and other locations. 2016—On March 1, Southwest Transmission Cooperative merges into AEPCO. Sierra Southwest Cooperative Services Inc. is now dedicated to serving as a vehicle to meet the renewable energy needs of Member cooperatives. AEPCO and Sierra operate under the banner of Arizona G&T Cooperatives. For more information, contact Arizona G&T Cooperatives for a copy of the book Arizona Electric Cooperative: Celebrating 50 Years of Cooperation.